While going through all of my Hawaii photos, I realized just how photo-crazy I got during our trip. Waseem literally said to me at one point “I don’t like being photographed all the time!” lolol paparazzi reality check for real but can you really blame me? By far, Hawaii is the most beautiful and interesting place I’ve traveled to yet, and because of all of the different things we got to see, do, and experience, our trip will be broken up into several different posts. First up.. The Modern Honolulu, where we spent our four beautiful days in Oʻahu. Located at the apex of Waikīkī, steps away from everything you could ask for: luxury shopping, yummy dining, the beach, The Modern was a nice change of scenery after our more laid back, slow-paced, stay in Maui. I think it was a nice way to slowly transition back to the hustle and bustle of Chicago. This hotel is known to be the destination for both business travelers and vacationers. We were greeted with lemonade, cool towels, and the most gorgeous leis in the lobby upon checking in, you have to see the broken surfboard art piece hanging above the desk — I didn’t get to snap a photo of it but you can see it creeping in the background of a photo of Waseem and me somewhere below. The art piece was designed by a local surfer, and the surfboards he used are real, broken in action, and signed by all of their riders, how cool! All I wanted during our trip was to get lei’d and I couldn’t stop obsessing over the beautiful ones The Modern adorned us with, I kept moving them around the room (& hung them in our rental car) throughout our entire stay just for photo opps lol. The Modern’s style is very contemporary and clean, it’s extravagant but minimalist at the same time. There are 353 rooms, including 26 oceanfront suites. We stayed in one of the suites and it was simply perfect. The off-white color palette and sheer drapes made me feel like I was in a beach house, I kept forgetting that I was in a city high-rise! The living room has two lanais (balconies!) which became my favorite selfie locations and our bedroom had a giant amazing window that was practically a faux-lanai. We had a beautiful view of the hotel’s two pools and the ocean from one lanai and a breathtaking view of the Ala Wai Harbor from the other and our bedroom. The bathroom was bright, modern, and luxurious.. I especially loved the wooden sliding door! Everyone was so nice and the service was great, rooms are serviced twice a day – I especially loved the night cool down service when they’d bring us ice, water bottles, and cookies. We spent our low-key days by the pool on our private daybed and the servers always made sure our glasses were full. WiFi is free, available throughout the building, and there are no sneaky resort fees! Enough with the chit chatting for now, I know you’re all ready to see the photos (trust me, it’s overload!) so I’ll continue in-between photos below!. Get used to seeing photos of this view at all different times of the day lol! Too gorgeous to not capture. A stunning view of the Ala Wai Harbor! A little sneaky peek at the surfboard art piece I mentioned earlier, behind us. 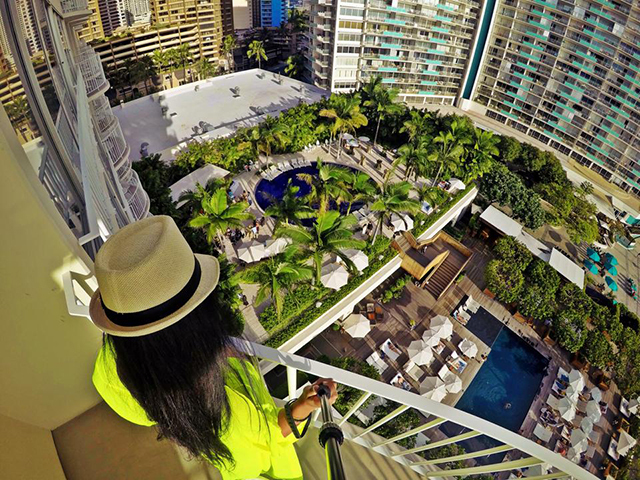 The Modern is the only boutique hotel in Honolulu with two pools! Sunset beach pool to the left, and Sunrise pool to the right. The Modern Honolulu is home to the famous Morimoto Waikiki by Iron Chef, Masaharu Morimoto! I wish we came with bigger appetites so we could have tried more of the menu but everything we did get was amazing! The fresh seafood is incredible, we started off with poke, a raw Hawaiian salad – if you like sushi or tartare, you will love poke! We finished off with a few rolls of sushi and I seriously wish we were in the mood to eat more! We just ate too much in the afternoon! The Obama’s dine at Morimoto’s every time they visit Oahu! One thing I was super excited about The Modern is it’s nightlife right in the building! In the lobby you’ll find a large bookshelf but at 5pm the wall rotates to a reveal a secret room, I thought those only existed in movies! Behind the bookshelf is The Modern’s unique, award winning speak-easy bar, The Study. I totally underestimated just how heavy my jetlag would be at night so I didn’t get to properly check it out outside of grabbing complimentary coffee and tea in the morning but it was poppin’ every time we walked by – live music, people pouring out into the lobby, super festive and the right kind of busy, never too crowded. The cocktails are named after authors and famous books and are all made with organic, island-based ingredients. Hawaii Magazine named The Study the “Best Lobby Bar”. If you’re not the laid-back lounge type, there’s even more! The Modern is home to Honolulu’s #1, A-list club, Addiction. I’m a geezer and decided to go back up to my room after a little bit to sleep but If we had a couple more nights during our trip I would have definitely gone back, so easy to just walk downstairs.. no looking for parking, no worries about valet, no cover for hotel guests. Easy peasy! Rihanna was there last year.. where was i?! Sigh! I was truly sad to leave, this was the first time that I was not ready to go back home! If you’re planning a trip to Oahu any time soon you absolutely have to check out The Modern, if you aren’t able to stay there you have to at least pop in for dinner or a drink. There was so much going on just while we were there with the Hawaii International Film Festival and Opera Ball, and then I found out that they’re the host hotel for Miss Hawaii USA! You all know I’m a huge fan of the Miss Universe Organization so yea… total worlds colliding 🙂 The Modern seems to be the place to be for everything young, cool, and happening! Mahalo for our lovely stay, I can’t wait to come back! Your trip looks amazing! I am also going to Hawaii in a few weeks and was wondering if you had any suggestions of things to do in Maui? Do you recommend doing the road to hana on our own or with a tour group? i would appreciate any advice! good luck with your move! Thank you Sammy! Road to Hana is absolutely incredible!! I found a GPS tour app and it was PERFECT!! It’s called Gypsy Guide and it’ll be the best $7 you ever spend haha… I would absolutely recommend getting that over going with a guide, then you can go at your own pace – see exactly what you want, etc. You open up the app early in the drive (before you lose phone service) and it will tell you about the history of everything you pass, tell you where to stop, where parking is, where to eat, everything! It’s so precise with your GPS location literally like “50 feet ahead you’ll see blahblahblah” – I coudl never imagine taking a printed map with me, we would miss everything because the mile markers are hard to see but the guide was perfect and it was actually really fun and interesting to listen to – it tells you the history of hawaii and maui and everything. you will have zeroooo phone service for most of the drive so make sure you open up your app early on. we were so lucky to have found it because we kind of winged the drive – if we didnt have it we wouldnt know where to go or where to stop because you cant even google anything up there! i could go on and on (which i will in my full hawaii post haha.. im STILL organizing photos from our trip). other things to do in Maui… haleakala (there’s a guide app for that too but we didn’t discover gypsy until after we did that), there’s a taco truck in kihei you HAVE to go to.. we went almost every single day i think it’s called horhitos… best tacos i’ve ever had! you have to get Ululani’s shaved ice, old lahaina luao was awesome too, ugh so much to do! I can’t wait to go back!!! Have SO much fun!!!! but seriously.. get that app haha we enjoyed it SO much – we had one for touring oahu too. make sure you start your road to hana drive EARLY.. we didnt start as early as we wanted and the drive back was so scary in the dark.. its a good 3 hour drive, super windy, cliffs everywhere, one lane over bridges, drive carefully!!! oh also!! make sure you have an aux cord! the stories and history the app-tour talks about is super interesting and really helps pass the time (it’s a longgg drive!) so you’ll enjoy it even more if you can listen properly. Irene when are you going to post the rest of your Hawaii stuff? And Maldives? Did the hotel host you for free so you could write an advertisement for their hotel? I love that you’re travel blogging now, you are so multi talented woman! And I can’t wait to see more!!!! LOVED seeing all these pictures. PS totally love the blog facelift.. looks awesome! Everything you do is SO cute and creative, I love your new little signature at the end of your posts! Beautiful photos, I can’t wait to see the rest and to see your Maldives vacation! WOW the pictures are stuuuninggg!! Loving the new blog look, I was just wondering this weekend about you and when I logged on to your website it said that it had been deleted or something and i miiight have freaked out. You and Waseem make such a beautiful couple. Definitely taking this hotel in consideration when I plan my stay in Hawaii.